Child Growth Tracker lets you import and export your data using CSV files. This guide describes how to do that and how the CSV files are formatted. You can import a CSV file of measurements either for an existing child, or for a new child. 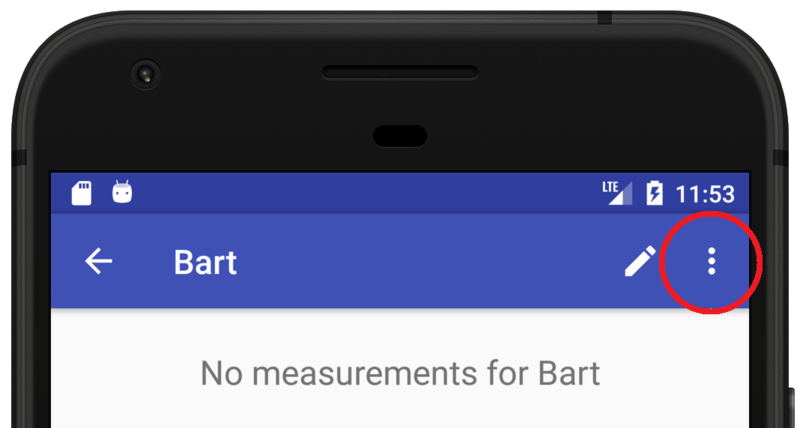 Note that this feature is only present on devices running standard installations of Android™ 4.4 (KitKat) or newer. 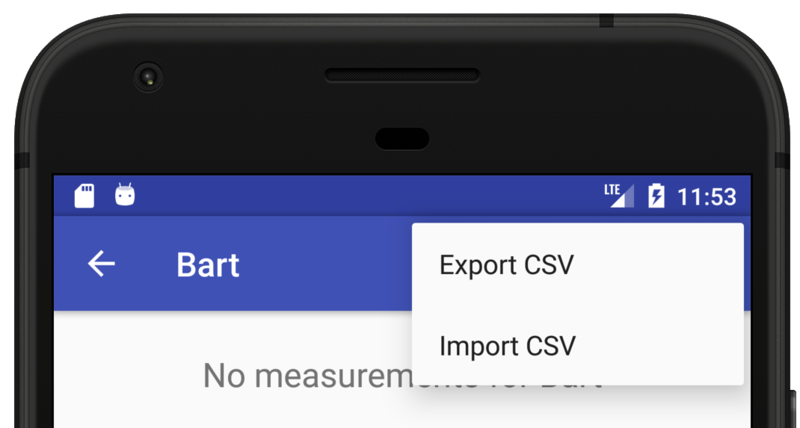 From the main screen, click on the child to go to his or her measurements page, click the three dot menu button in the top right corner, and select "Import" to find a CSV file in your downloads folder or Google Drive. This is also where to go to export the data from an existing child to a CSV file. The import will skip any duplicate measurements. 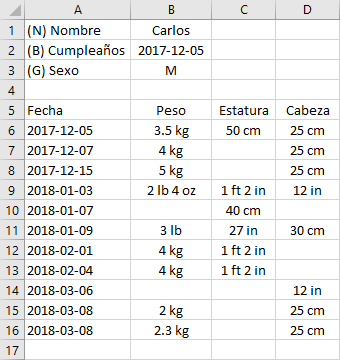 If the file being imported has a header section indicating the child's name, birthday, due date, or gender all of these will be ignored when importing data for an existing child. 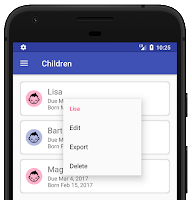 From the main child list screen, click the three-dot menu in the upper right corner and choose "Import" to import a new child or children from a CSV file. To export a CSV file of a child in the database, you can follow the steps in the first import option but select the "Export" option. You can also export all children to a single CSV file from the main child list, or long-click on a child from the main child list and select "Export" from there to export a single child. When you export the file, you can choose to save it locally to your phone, or to your Google Drive folder so it is backed up in the cloud. The CSV file can be generated using Excel or a similar program. Column A should have the date, column B should have the weight, column C should have the height, and column D should have the head measurement. All the values should be entered with units. Adding column headers is optional. Note on Date Formatting: Some of the examples here show a US-style date string (month/day/year). The best format to use for guaranteed consistency between devices is the ISO international format of (yyyy-mm-dd). In this format, the first of March 2017 would be "2017-03-01". Child Growth Tracker will always look first for an ISO date, followed by Locale-specific formats. This means that if you generate a CSV file in the US and list the first of March as (3/1/2017) and send it to someone in the UK, their phone will import that date as the third of January. The import will skip any rows it cannot understand. In this example, it imported four measurements and skipped the first row (the header row) and the last row (blank row 6). If it cannot understand just a part of an entry (for example, if you entered "23 in" in the weight column) it would just skip that part of the measurement. You can also include a header section with data about the child, including name, birthday, due date, and gender. These can be in any order, and you can omit any of them (for example, if you don't know the due date you don't have to put it in). 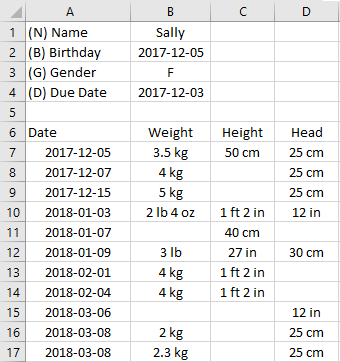 The word in Column A should begin with (N) for name, (B) for birthday, (D) for due date, or (G) for gender. Any text after that is ignored so it can be in whatever language you prefer. The gender should be indicated as "M" for male, or "F" for female. When you save it, select the CSV file format.